Anthony Clark was born in County Antrim, Northern Ireland, in 1739. He emigrated to the United States about 1752 according to our best estimates, most likely to Pennsylvania. 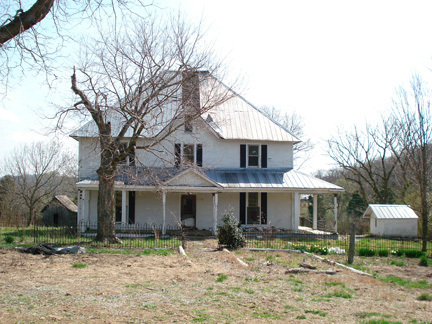 It was there that he met and married Mary Elizabeth Oates on 3 November 1774 in Mercersburg, Franklin County. They emigrated to Lincoln County, North Carolina, after their first child was born in 1775. It was there that Mary died, apparently during the birth of their ninth child, Fannie. Anthony married Susannah McClure about 1803; they had three children. Prior to 1820, they relocated to Bedford County, Tennessee. Anthony Clark died there in 1827 where he was buried in the Clark Cemetery, near Bell Buckle, Tennessee. Some of the descendants who recently found the burial ground unattended have begun a project to restore the cemetery and preserve this history. Clark family home near Bell Buckle, Tennessee. Documented on this site is the data compiled on their descendants, dispersed throughout the United States. It is not complete, nor is it all verified. Your contributions to correct any errors or add to the record will be Appreciated. Names of living persons are intentionally blanked out to protect privacy. The Clark Family , The Millers of Millersburg and Their Descendants, with kindred families of Miller, McGee, Jameson, Read, Scott Wyatt Donnelly, White, Washington, Blackwell, Smith, Mayfield, Johnson, Kuykendall, Beene, Sadler, Clark, Woodfin, Whiteside and Myers Part I. Genealogies; Author: John Bailey Calvert Nicklin, Gustavus Hindman Miller Publisher: [Nashville, Brandon Printing Co.] 1923. An extract which covers the Clark Family. Rufus Anthony Clark , A History of Tennessee and Tennesseeans By Will Thomas Hale, Dixon Lanier Merritt. A short biography of Rufus Anthony Clark, Noted Tennessee educator. Harry Henderson Clark History of the Yale College Class of 1903 , by Yale University Class of 1903. A brief biograph of Harry Henderson Clark who later became Professor of Education at the University of Tennessee. Mrs. Connell an AROUND TOWN column by Don Lambert, Smackover Journal newspaper. An article in memory of first grade teacher, Audrey Clark Connell, a noted long-time teacher in the public schools at Smackover, Arkansas. In Memoriam by G. David Dixon, M.D., Radiology Journal, 2002. An article in memoriam to Dr. Joe Lee Rector, Jr., Retired Chief of Radiation Therapy at St. Luke's Hospital, Kansas City, MO. Genealogist, Writer and Historian The Butler Banner, Spring 2008. Article about the Yingling Ruth Rector Papers Donated to the Butler Center for Arkansas Studies at the Central Arkansas Library System in Little Rock. Her husband, Dr. Joe Lee Rector, was a fourth great grandson of Anthony Clark. Bernie Moore, College Football Hall of Fame ; biography of Bernie Moore (1895-1967), coach at Mercer and Louisiana State Universities and Commissioner of the Southeastern Conference. Bernie Moore was married to Anna Louise Clark, the third child of Rufus Anthony Clark and a second great granddaughter of Anthony Clark. Clark House, Winchester TN. Newspaper articles describe history of historic Henderson-Clark-Moore home, now demolished, in Winchester TN.